Abstract: This study presents a joint seismic forward modelling and frequency decomposition (FD) workflow on the Thebe gas discovery, offshore NW Australia to isolate and quantify the effects of hydrocarbon saturation on FD color blends. Observations from real life blends are compared to equivalent synthetic seismic models created through comprehensive rock physics modelling at two well locations: Thebe-1 and Thebe-2. Primary gas bearing sand units within the Triassic Mungaroo Formation have been identified and are associated with discrete high intensity and low frequency responses with low frequency shadows directly beneath a pronounced gas contact. Sensitivity analysis through fluid substitution and seismic forward modelling has confirmed that fluid effects play a significant role on the underlying frequency responses and yield unique interference patterns in gas saturated sands. The spatial distribution (in 2D and 3D) of these gas bearing sands were assessed by propagating comparable frequency responses away from well control using a statistical based seismic classification system. The lateral extent of the high-quality gas bearing sands were largely confined to an elongated horst block in the south, and a narrow arcuate fault block in the centre of the Thebe field. These gas bearing sands alone equated to an estimated 0.58 Tcf and 0.14 Tcf of gas in place (GIIP) for the southern and central block respectively. 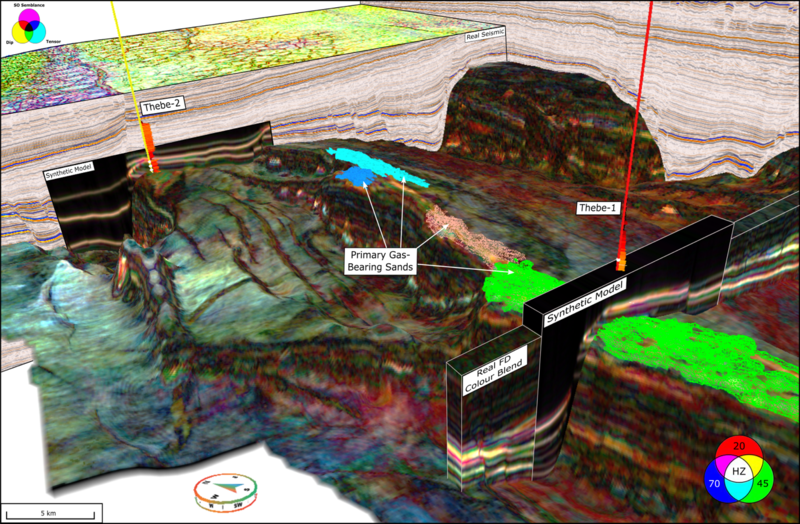 The application of these techniques on the Thebe gas discovery, is a prime example of how effective they are in characterizing reservoirs with the potential to identify ‘sweet-spot’ drilling locations and to de-risk future development plans.